...and in with the new. I'm not referring to the year but our bedroom doors. The new baseboard lead to us deciding we should get new trim for the doors. Well it started with me thinking that the front door should be trimmed like the window right next to it. Then looking down the hall we thought it would look nice to change the door trim there since the bathroom was already updated. 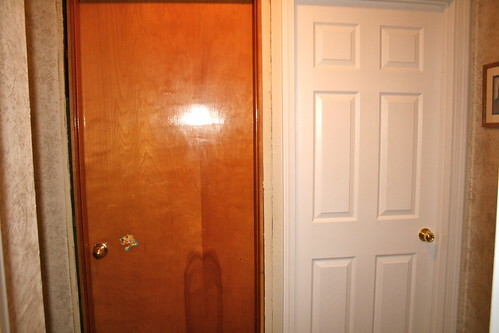 Then we thought we really should get new doors too. Mickey has put in two of the three. It really lightens up the hall and the bedrooms. They look SO MUCH better. It doesn't feel old anymore. Why didn't we do this five years ago? The answer is because we were remodeling the bathroom (I thought that link would have pictures but it doesn't, darn) and I was very pregnant (I looked there are no pictures of this, THANK GOODNESS). Looks so great! What a handy husband you have. You guys are great at home remodeling. I miss the blueberry yogurt walls. Janel, if you'd like the blueberry yogurt in your house the color is June Irises and it's a Martha Stewart color. I love it too! Michelle, I'm so glad I have a handy husband. I can't imagine how much I'd have to pay someone to get this done. Yikes!